Los Angeles is asking residents to capture their stormwater to help the desert city achieve water sustainability.Click image to enlarge. LOS ANGELES — Faced with four years of deep drought that revealed significant vulnerabilities in its water supply, Los Angeles intends to capture stormwater as an important new source of water for the city. To put this strategy into effect, the Los Angeles Department of Water and Power prepared a Stormwater Capture Master Plan and presented it to the Board of Commissioners earlier this month. The plan, one of the most comprehensive in the nation, is encouraging Los Angeles to see itself for what it really is: a city in a desert, which cannot afford to let scarce rainfall pass through unused. 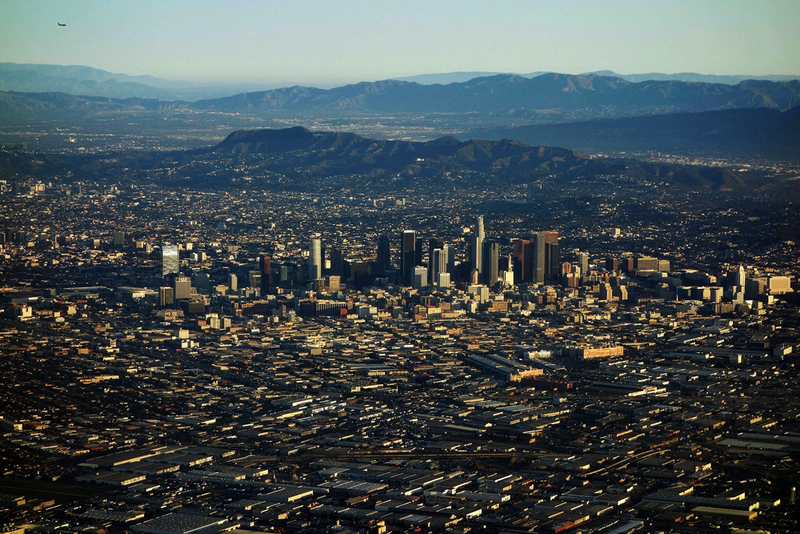 Los Angeles is one of a number of cities in California and across the American West that are reassessing the supply and use of fresh water and finding untapped resources within their jurisdictions. In the Central Valley, for instance, Modesto and Turlock are the latest California cities to upgrade their water treatment plants to meet tougher water quality discharge standards and simultaneously provide water to irrigate farmland. City ordinances that encourage the conversion of yards from water-wasting grass to desert plants and landscaping also are widespread in California. The home-based, neighborhood-scale, decentralized approach is a sharp departure from the water use and supply strategy of the 20th century, which focused on constructing mammoth dams, reservoirs, and canal networks to store and transport water to farmers, businesses, and citizens in a state that was half the size it is today. Los Angeles’ new stormwater capture plan is just one step of many that the city is taking to increase the efficiency and sustainability of its water use. The city government, with the help of local experts, is crafting new policies that hand the reins of water capture over to Angelenos themselves, empowering city residents to take charge of their own water by harnessing what comes from the sky. The City of Los Angeles is almost exclusively dependent on imported water for the 12.8 billion liters (3.4 billion gallons) of water it uses each week, according to the city water department. The city reports that 87 percent of its water comes from outside city limits, an average of 320 kilometers (200 miles) away. If the city of 4 million people intends to survive what scientists predict will be more prevalent and deeper dry spells in the West, the city’s water supply system needs to change. That is where the stormwater plan comes in. The final draft amounts to a menu of large- and small-scale projects that help the city capture the little rain that does exist in the arid climate. On the granular level, individual homes are encouraged to purchase rain barrels and cisterns. Entire communities can also take advantage of new initiatives such as community storage basins, underground storage and treatment systems, and water efficiency practices. All told, the techniques included in the plan have the potential to triple the amount of stormwater captured by the city to nearly 200,000 acre feet of water per year, equivalent to more than a third of the city’s current annual water demand. The process of creating the stormwater capture plan began in 2013. Its completion comes on the heels of a late 2014 water conservation directive from Los Angeles Mayor Eric Garcetti. Directive #5 ordered the LADWP to cut potable water imports by 50 percent by 2024, as well as a citywide water use reduction of 20 percent in 2 years. According to the LADWP, municipal water sustainability can be achieved in three main ways: conservation, capture, and recycling. The city began an aggressive water conservation plan in the 1980s in response to the 1982 drought. Since that time, the population of the city has doubled while water consumption per capita has remained relatively stable — at about 500 liters (132 gallons) per day, one of the lowest amounts in a large U.S. city. Pettijohn attributes this success to the many investments made in water conservation throughout the past 40 years. By providing incentives, Angelenos were encouraged to change their behavior, and thus the culture of water usage was changed as well. Though the stormwater plan indicates greater investment in water capture, many barriers still exist that prevent the city from utilizing its water recycling potential. There is currently a project in place to recycle 30,000 acre feet of treated water into the San Fernando Aquifer by 2022, but its full potential is still stunted by the lack of cooperation across state lines. Mark Gold is the project leader for the UCLA Sustainable LA Grand Challenge, a research initiative out of the University of California, Los Angeles that aims to help the city achieve 100 percent water sustainability by 2020. He believes that large infrastructure overhauls that focus on water recycling, in addition to capture projects, must happen in order to create the water sustainability that Los Angeles needs. The high cost of these projects is a huge impediment. Even though the LADWP is asking for its budget to double to address water issues in coming years, it still may not be enough. However, Bloome trusts the policy put forward in the stormwater capture plan – empowering citizens to create change for Los Angeles’ water use in their own lives. “If I were to put my money on something, I would put it on small, decentralized green projects,” said Bloome. This month, Circle of Blue is hosting Catalyst: Defining Water’s Future, a series of urgent, interactive town hall sessions. The immersive events connect California’s drought emergency to global problems of water supply and demand. On August 18, policymakers and water experts from around the world joined the town hall to discuss California’s volatile water future. Here’s what they had to say about stormwater use in Los Angeles. Richard Luthy, Director of the National Science Foundation’s research group on Reinventing the Nation’s Urban Water Infrastructure, on how cities should be rethinking their urban infrastructure. Martin Adams, Senior Assistant General Manager of the Water System for the Los Angeles Dept. of Water, on what is needed for a water transition in Los Angeles. Martin Adams on leveraging the public and the roll of decentralized stormwater capture in creating value for water. Richard Luthy on creating stormwater capture sites that also function as green spaces in Los Angeles. Register free of charge for the next Catalyst: event live from World Water Week in Stockholm here. Hey, alright…baby steps. Took forty years to finally come full-circle from 1977. The irony, of course, is that California has the same governor (as they did back then), and everyone is surprised that weather is cyclic. Using storm drains as recycled water? Las Vegas has been doing that for 30 years!